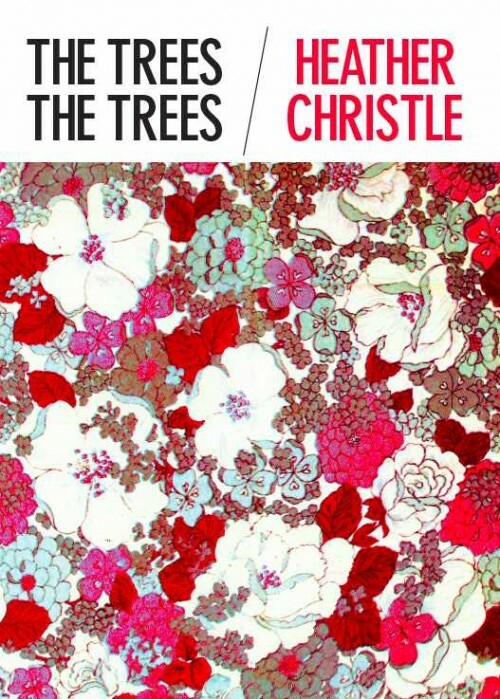 A new Heather Christle poem makes a day jump up the ladder a little bit more, the idea of “seeing” not turned on its head, but turned into a new head altogether. 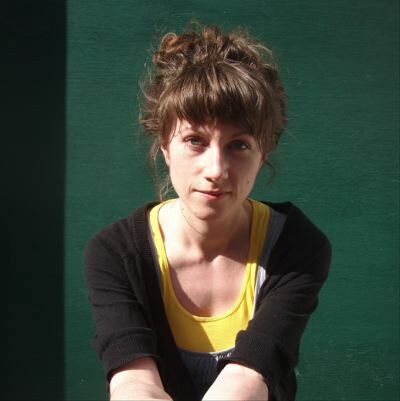 This poem “And This Too Comes Apart” battles death and motherhood, choices and weird joy. I love the unpredictability in the emotions of this poem, how as the thought process continues into these BIG ISSUES, like in life, the emotions flip and flop, jumble and jangle. 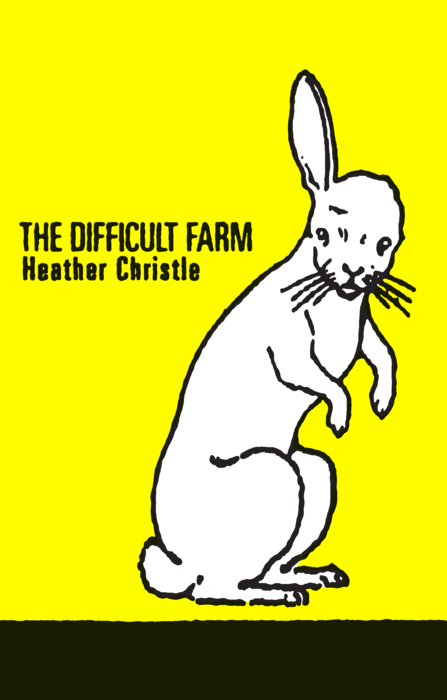 Check out the entirety of this poem, and maybe even let Heather read it to you! The long awaited return of Vouched Presents Indy is at hand! 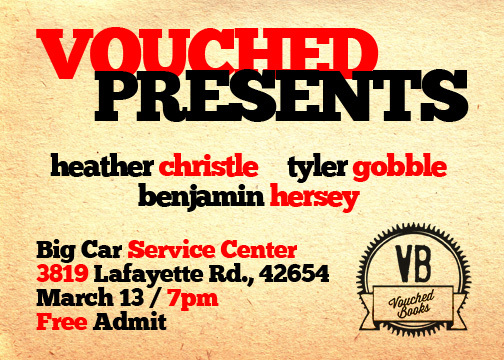 Join us for a night of poems and performances by Heather Christle, Benjamin Hersey, and Vouched’s own Tyler Gobble. As always, beverages will be on hand for your faces so come thirsty. RSVP to the Facebook event so we know to expect you! Proceeds from the evening go to support Second Story Indy, an organization that connects local youth with literature and encourages expression and learning through creative writing. I just finished this book, why I didn’t read it sooner is beyond me, and I wanted to say, “I think it’s really good,” but that’s a bad single-sentence review. The busyness of the poems, of the speaker’s mind, remind me of right now, it’s Christmas, and weird things are happening, and I’m thinking things, and people are playing professional sports, and other people are getting fatter, and a bird outside is flying because it wants to. Yeah, I just admitted I wish I had read it sooner, but maybe the only other time I wish I’d read it was during Christmas time last year, the only time hectic in this place, by place I mean my house and my head, that collide with, or perhaps compliment, these poems so well. In their strangeness, these poems can chatter with the best of them, that meaningful chatter making me want to interact, to get up and trot around, to find a nice ear or hole in the world and talk into it. All this is me trying to say, THANK YOU HEATHER CHRISTLE FOR THIS FEARLESSLY GO-GOING BOOK AND SORRY IT TOOK ME SO LONG AND HAPPY HOLIDAYS. and we stepped out of the car, amazed. It was the color of somebody’s carpet. the asphalt and everyone’s terrible behavior. And I quoted more of that than I planned, but read the whole glorious thing at Sixth Finch. Or buy the book from Octopus Books. Or from Laura at the VouchedATL table if you’re so lucky to be near that goodness.